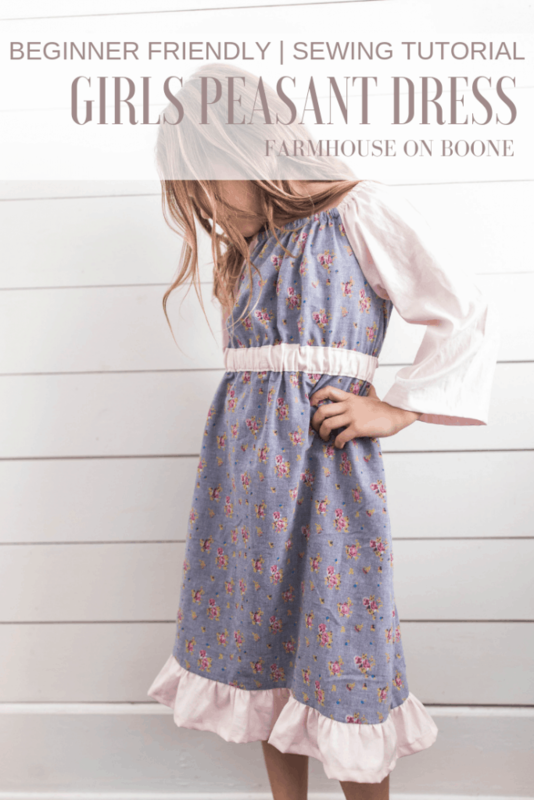 This simple fall peasant dress for girls is a simple sewing pattern for beginners. 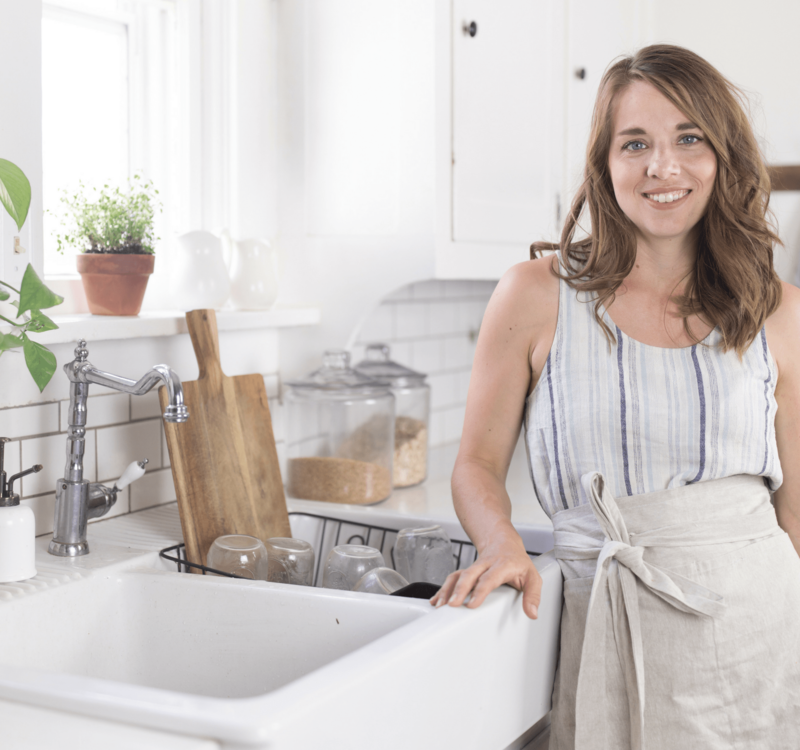 The step by step video tutorial walks you through the entire process with measurements for size 12 months up to girls 10/12. 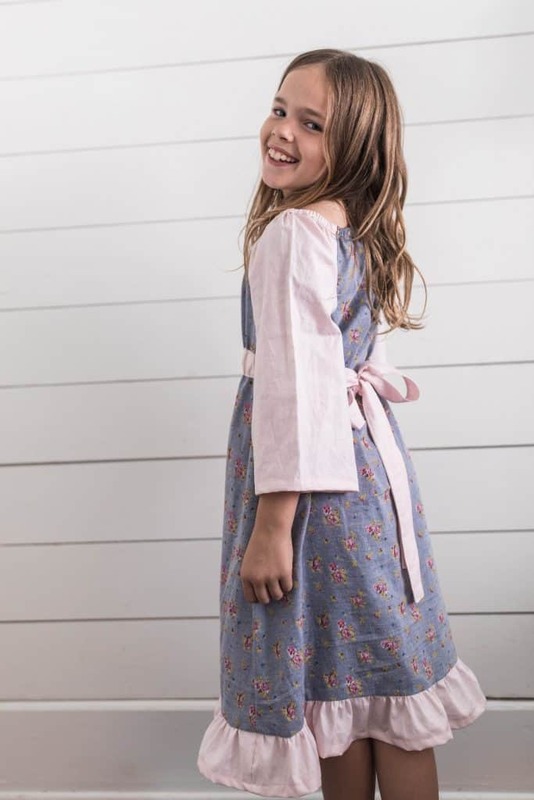 When I first started sewing dresses for my little girls, my favorite style was (and probably still is!) the peasant dress. It is by far the easiest dress to sew, and perfect for beginners. It is also sooo customizable! 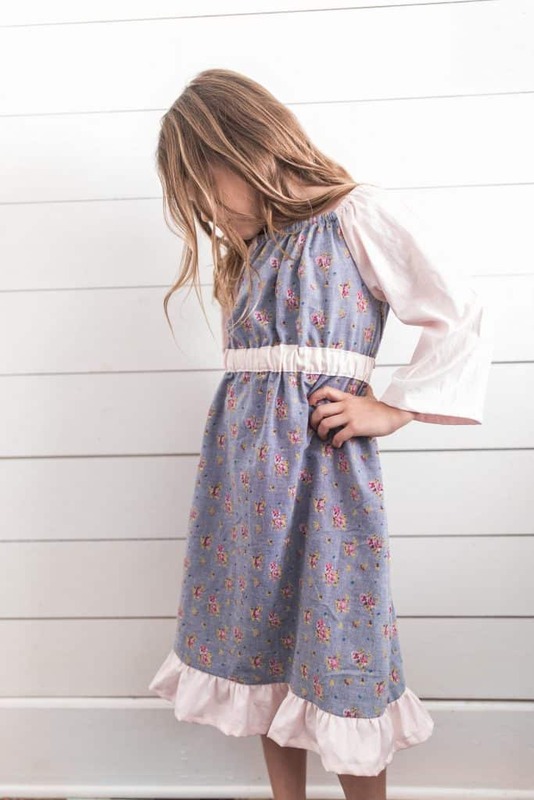 Once you get comfortable sewing the basic peasant dress, you can start adding layers of ruffles, aprons, different prints in the bodice, ties. There is endless opportunities for creativity! You can make the sleeves, long short or 3/4. You can even add ruffles to the sleeve. You can crop the dress and make it a peasant top. 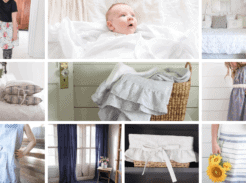 They are perfect for all ages and sizes. Kids can wear them for many years, because the loose shape and elastic allow for growth. I even once made myself a peasant style top using the exact same principles! 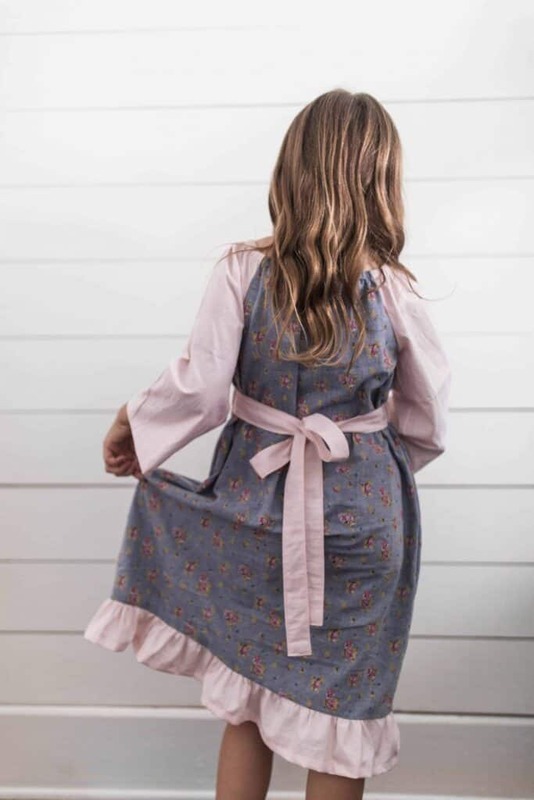 For this tutorial today, I’m going to give you the measurements you need to sew a 3/4 sleeve length peasant style dress, with an elastic waistband and the option for one ruffle at the bottom. Once you get good at sewing this basic style, I encourage you to run wild with customizations. Fabric- 2 yards cotton or linen work great. Avoid stretchy knits. With a small piece of paper or scrap fabric, but a rectangle 2″ by 4″ for sizes 12 months through 4T and 2″ by 5″ for 5T through 10/12. Now draw curved line to round off one edge of the piece. (Refer to the photo below.) This will be your pattern piece to create arm hole areas on the bodice. 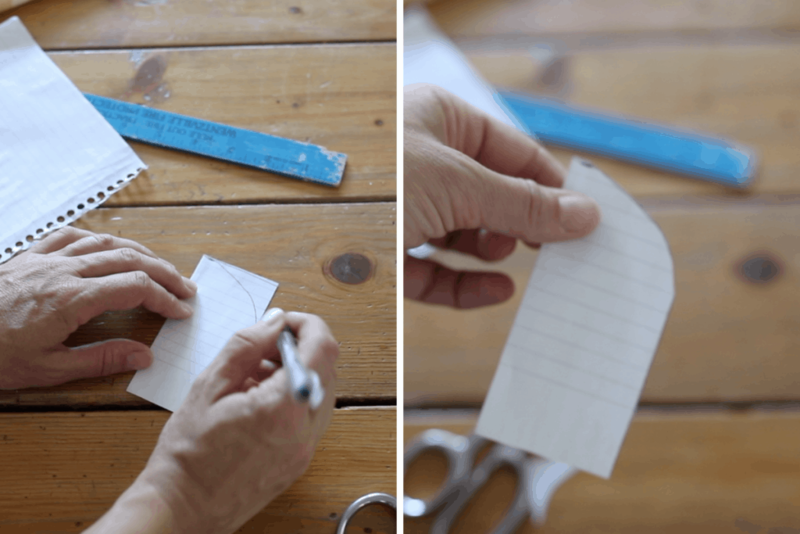 To create the armholes from the paper pattern you just created, fold one main dress piece in half with right sides together. Line up your little patter piece with the outside and top edges of the bodice. Cut around the pattern piece. Repeat for the other main dress piece and the two sleeve pieces. Now that the sleeve pieces are sewn onto one of the main dress pieces, it is time to bring in the other main dress piece. Line up one sleeve with the other main dress piece along the armhole, with right sides together. Sew along the curved sleeve with a 1/4″ seam. Repeat with the other sleeve, so that the four pieces (the two main pieces and the two sleeve pieces) are attached in a circular fashion. Fold the dress in half with right sides together, so that the bottom raw edges of the two main pieces are lined up. With the front main piece and back main piece lined up at the armpit, pin from the bottom of the hem all the up around the armpit and to the bottom of the sleeve. Repeat with the other side of the dress. Sew the up the side seam and down the inside of the sleeve with a 1/2″ seam. Repeat with the other side. Finish off the raw edges inside with a serger or tight zigzag stitch. Fold the top edge of the dress down 1/2″ and then another 1/2″, with the raw edges hidden inside. Sew the neck casing down with a 1/2″ seam, leaving a 1″ space open for the elastic. Overlap the two ends of the elastic about 1″ and back a forward stitch several times over the elastic to attach it together and make sure it doesn’t come out. Sew the elastic opening closed with a topstitch. Press the ends of the sleeves up about 5/8″” and then another 5/8″, hiding the raw edges inside. Sew the sleeve hem in place with about a 1/2″ seam. You can make the sleeves longer for a long sleeve dress, or crop them for a short sleeve dress. 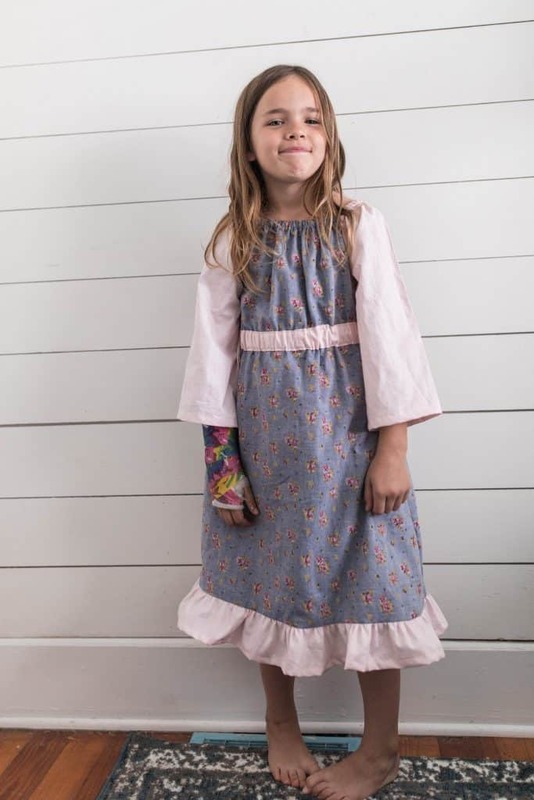 It is also cute to add elastic to the ends of the sleeves, especially in styles for younger girls. On the short ends of the waist tie piece, press over ½” toward the “wrong side” of the fabric. Fold the waist tie piece in half all the way down the long side, right sides together, and sew a ¼” seam. Leave the two ends open at this point. Using a large safety pin at one corner, turn the waist tie piece right side out. Sew a narrow seam along the op of the waist tie, from one side seam to the other. Repeat with the bottom of the waist tie piece. For the two ends of the waist tie that are still hanging off the dress, topstitch all the way around with a narrow seam. Push the 1″ elastic piece through the waist tie, attached to the front of the dress, with a large safety pin. Secure it at both ends of the elastic, near the side seams with several back and forward stitches to hold it in place. Stitch just beyond the elastic on both side seams to hide the elastic inside. Fold the bottom hem up 5/8″ and then another 5/8″, hiding the raw edges inside. 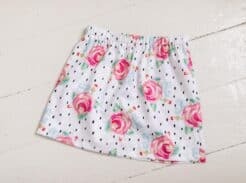 Sew all the way around with a 1/2″ seam, making sure to back and forward stitch. Stitch the two ruffle pieces together at the two short ends, with right sides together, with a 1/2″ seam. Use a serger or tight zigzag stitch to finish off the raw edges. To sew a hem in the bottom of the ruffle piece, press the bottom of the ruffle up about 5/8″” and then another 5/8″, hiding the raw edges inside. Sew the hem in place with about a 1/2″ seam. Sew a gathering stitch in the top of the ruffle piece. Pull the gather strings until the size of the ruffle piece matches the bottom of the dress piece. Pin the ruffle piece to the main dress piece with right sides together, and the side seams lined up. Sew the ruffle to the main dress piece, sewing closely to the gathering stitch. Use a zigzag stitch or serger to finish the seam. To add a ruffle (optional) Cut 2- 4″ wide by 30″ long and decrease the length of the two main dress pieces by 2.5″. To add a ruffle (optional) Cut 2- 4″ wide by 34″ long and decrease the length of the two main dress pieces by 2.5″. To add a ruffle (optional) Cut 2- 4″ wide by 36″ long and decrease the length of the two main dress pieces by 2.5″. To add a ruffle (optional) Cut 2- 4″ wide by 38″ long and decrease the length of the two main dress pieces by 2.5″. To add a ruffle (optional) Cut 2- 4.5″ wide by 40″ long and decrease the length of the two main dress pieces by 3″. To add a ruffle (optional) Cut 2- 4.5″ wide by 42″ long and decrease the length of the two main dress pieces by 3″. To add a ruffle (optional) Cut 2- 4.5″ wide by 45″ long and decrease the length of the two main dress pieces by 3″. To add a ruffle (optional) Cut 2- 4.5″ wide by 47″ long and decrease the length of the two main dress pieces by 3″. To add a ruffle (optional) Cut 2- 4.5″ wide by 51″ long and decrease the length of the two main dress pieces by 3″. May 2019 be awesome for you! 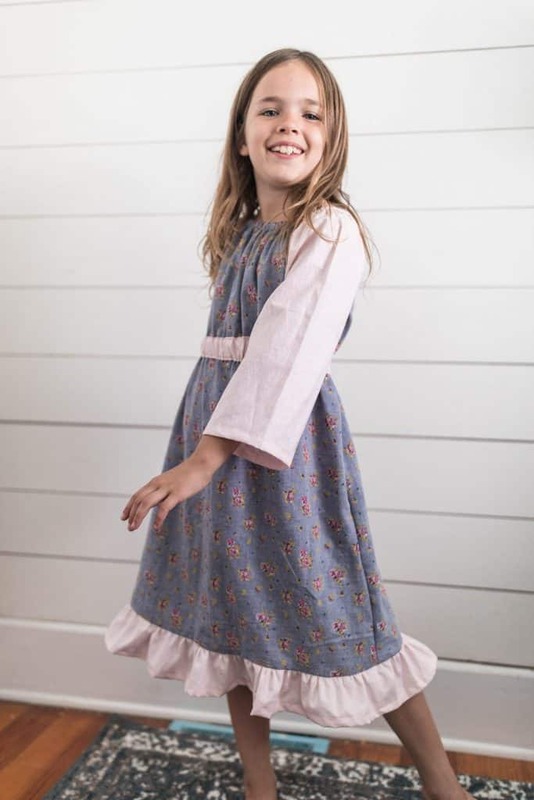 I’m assuming that for the pattern I’d chose another one of my daughter’s dresses, fold in half and trace around it, like you did in the ‘how to make a dress’ video. Would that be the pattern I use even if the dress I trace isn’t a peasant dress or doesn’t have sleeves?